When it comes to a family vacation, there’s not much that’s better than taking a cruise. Cruising offers a chance for the entire family to sail together, with something to do for all ages. So whether you’re traveling with a one-year-old, a ten-year-old, or something in between, everyone will have a chance to make the most of their vacation. Of course, if you’re a parent then you know that even the simplest of tasks takes planning when you have kids. A cruise is no different. While it’s an easy vacation with the kiddos, there is still plenty for you to know and plenty you can do to make the cruise go even smoother. That’s why we’ve put together a list of some of the most useful tips for cruising with babies, toddlers or small kids. From how to keep them entertained on the ship to making sure they stay healthy, these tips run the gamut of what to think about before you take a cruise. Given all the strict rules around bringing drinks on board a cruise, it might seem like you wouldn’t be able to bring food either. In fact, bringing pre-packaged food is perfectly fine. Feel free to bring baby food (including those pouches that kids love), as well as your kid’s favorite snacks to keep them happy on the trip. Just make sure that you don’t bring any homemade food. It’s not allowed on ships due to health concerns and issues with customs in other countries. If you have kids, then you know every parent’s dread of having them go wild in front of other people while you attempt to wrangle them in. That’s why it’s a good idea to scout out somewhere on the ship the first day that has the space for kids to run around without lots of people around. We’ve found them most often toward the back of the ship. These spots allow you to let the kids play on their own without worrying about bothering other passengers. The special kids areas on the ships are great for parents. It’s a spot to drop off your kids for free while you get a little personal time and the kids have a blast. Unfortunately, they are only for kids that are a little older. For example, kids must be two years old before they can join in Carnival’s kids activities on their own; Royal Caribbean requires kids be at least three years old. There are still things for them to do, but you must supervise them or pay an extra fee for them to be watched while adults play. In general, we recommend packing less than what you need. No one needs four different swimsuits or six pairs of shoes on a cruise. However, being a parent, we are more than willing to overpack when it comes to our kid. The reason being, with so many people on the ship, we do our best to keep the kid happy during the cruise. The last thing we want is a baby who is grumpy and crying — and bothering other passengers — because we forgot something at home. Kids — especially small kids — seem like they constantly get sick. And the only thing worse than a sick kid is not being able to provide them any relief. There is a doctor on board every cruise ship, but it’s still a good idea to pack over-the-counter items like Benadryl and Tylenol for your kid to take should they come down with a bug. It’s a small peace of mind should your little guy or gal come down with something on your vacation. Is your little one still in diapers? If so, then you should pick your ship carefully. Most ships don’t allow kids that aren’t toilet-trained into any pools due to health regulations. There are a few Royal Caribbean ships that we know that have special areas for smaller kids still in swim diapers. It’s a section of a larger play area, but better than no water time at all. Bottom line: If you still have a kid in diapers then don’t expect to spend a ton of time playing in the pools on the ship. You can, of course, find a beach in a port of call to get their time in the water. Our son asleep in the Carnival-provided crib. Does your kiddo still sleep in a crib? 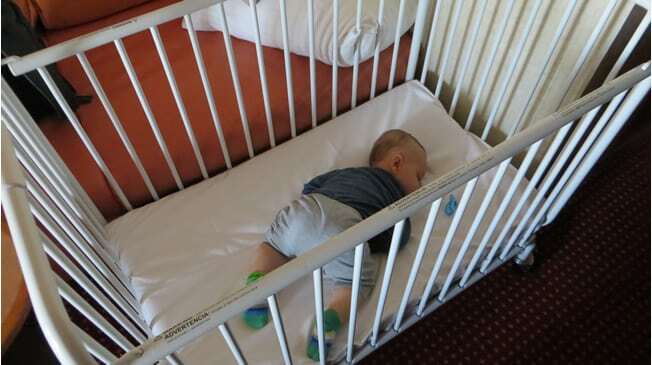 No need to bring the Pack-and-Play, cruise lines have cribs that they can put in your room. They won’t be overly fancy, but it is a dedicated spot for your little one to sleep while on vacation. Best of all, there is no charge for this service. While cruise lines have dedicated places for kids to play while being supervised by the staff, many also offer in-room sitter service as well. This is ideal for when you want to lay the kid down for the night, but still want to go out and enjoy the ship’s nightlife. It’s not cheap — we’ve seen prices around $20 per hour. However, considering the alternative is sitting quietly in the room while your child sleeps, it’s not a bad deal. At home, those mid-afternoon naps are amazing. You can get so much done around the house while the kids get his/her rest. On a ship? They are kind of boring. When the kid takes a nap, you are stuck in the cabin keeping an eye on them… instead of hanging out poolside or playing in the casino. That’s why we suggest a balcony cabin for parents with napping kids. This way, there is a space you can go out, talk in a normal voice, and get some fresh air. It’s much nicer watching the waves go by on the balcony than sitting in a dark cabin. Have a Diaper Genie at home? They are great for keeping dirty diapers from stinking up the house. But what about in a small cabin? What do you do with those soiled diapers? If you have a balcony room, you can set the dirty diapers in the room trash can and set it outside to keep the air in your cabin clear. If you don’t have a balcony, we suggest bringing some Ziploc bags to seal up those dirty diapers, along with some air freshener. Modern cruise ships all have an arcade tucked away that’s perfect for the kids to have some fun on their own — or with mom and dad. The arcades can be pricey, but it’s worth it to get some alone time during your cruise. Instead of quarters, the arcades use your room’s keycard to access your onboard account. For that reason, you’ll want to make sure that your kids understand a budget before you let them loose on their own. Netflix now has a great feature that lets you download movies to your device so you can watch them without an Internet connection. This makes the service perfect for cruise ships. You can download movies beforehand that will help entertain the kids if they don’t want to be outside or just want to take a break. If you have Netflix, you can learn more about downloading movies here. If your child isn’t quite big enough to walk all day, then you’re likely bringing a stroller. But forget that big bulky jogging stroller at home. Space is tight in a cabin, so smaller umbrella strollers — which also fold up to fit in a closet — are ideal. When it comes time to use, these small strollers are also easily maneuverable down the ship’s narrow halls and can easily turn to navigate a crowd. In addition to realizing that the heat can take a toll on kids, you should also be sure to plan your day around naps. There’s nothing worse than being out and about when your kid decides it’s time to crash. Be sure to plan on being somewhere that the kiddo can crash — whether it’s hanging out on the beach under an umbrella with a lounger or making it back to the cabin in time for naptime. Cruise ships have high chairs for your little one to sit in, but we also suggest bringing a silicone placemat for them to use while they eat. These mats stick to almost any surface and are easily washable. This way, not only do you keep the table or high chair from getting dirty, but you also keep food from sitting on a potentially unclean surface. It’s just a better solution all around for when it’s time to eat. Chance are you still get up at least once or twice to soothe your kid while they sleep. Or even if your kid sleeps all the way through the night, you might get up to use the restroom. In an unfamiliar cabin with lots of heavy furniture, that can be a disaster for your shins and feet. Be sure to pack a small nightlight to provide a little extra light to see by if you have to get up in the middle of the night. This is especially important for dark interior cabins. Most people envision eating in the main dining room, cracking into a lobster or slicing a steak. Truth is that parents with small kids — the sort that won’t sit still to eat for more than five minutes at a time — might prefer to to dine in the buffet during the evenings. At night, the less formal buffet is also less crowded, meaning you won’t be as stressed is someone doesn’t want to sit down and eat their dinner. It’s not often mentioned, but the heat and humidity can zap the energy of even the most energetic kids. If you have an especially small kid or toddler, expect them to be able to stay up only half as long before they need to nap and recharge. If you are planning a long excursion without many points to take a break, then you might want to reconsider your plan. If you have a kid with a lot of energy, then you will be happy to know they should sleep very well after a long day in the heat. Each day you’ll receive a schedule of what’s going on all around the ship. Take a few minutes to search the activities and circle the items that look promising to do with your kid. By planning ahead, you can make sure that you know where to be and when so that your kids don’t miss something that they’ll love to do. Some excursions have a ton of elements — taxi rides to adventure parks to beach breaks to boat rides. The smaller your kids, the smarter it is to keep things simple. Just heading out to the beach is more than enough for babies and toddlers. Don’t stress yourself out trying to handle a kid on a wild excursion; you’ll just make your trip less enjoyable for both you and your kids. If your kid is used to taking baths, then they (and you) need to be prepared for the showers in the cabin. The showers come with a detachable spray handle, and are pretty small. It’s easiest just to have them stand while you give them a quick bath. If they like playing with a water hose (our kid loves it), then showers with the spray handle are a lot of fun for them. What sort of documents do you need to travel with a child? A passport is always the best idea as it offers the most flexibility. Should something happen and you need to fly back home, a passport is what you need. However, on most cruises (those that begin and end at the same port), kids can travel with an official birth certificate. Frankly, this is much easier and less expensive than getting a passport and works in most cases. Older kids (those 16 years or older) also need to have a photo ID. If you have a newborn, don’t plan your cruise just yet. In most cases a child needs to be at least six months old before they are allowed to board the ship. There are some trips where a child must be at least one year old before they can sail. This includes sailings over long distances with more than two consecutive days at sea. The cruise lines don’t want to have a small child on the ship and be too far from any possible medical help should an issue arise. The thing about cruising is that if you run out of something, you can’t just easily run to the store for more. So when you are packing consumables like diapers, wipes, and the like, go ahead and pack even more than you normally would. Worst case scenario is that you don’t use them on the ship. Best case is that you have an issue and end up being covered until you can get back to home. Are you used to sleeping in your room while your child sleeps in another? If so, be prepared for some rougher nights. It’s one thing to hear your kid cry through a baby monitor set at low volume. It’s another thing altogether to have the baby making noise in their crib that’s just a few feet from your bed. Be ready and expect that you might not get the greatest night’s sleep while your little one is sharing the cabin. Yep, you likely already know that sunscreen is a must. At the lower latitudes the sun is stronger and can burn sensitive skin quickly. But let’s face it, putting on sunscreen every hour is a greasy affair — and not much fun when you’re trying to do it to a wiggly two-year-old. Instead, look for a swim shirt that covers up most of a kid’s torso, leaving just face and arms to sunscreen. Not only is it easier than having to lotion everywhere, it’s also more foolproof and quicker. In your cabin closet, you’ll find life jackets for use in case of emergency. Be sure to check that there is also a kid’s life jacket if you are traveling with child. If not, just ask your cabin steward and they can get you one. Chances are slim that you’ll use it, but you should have it just in case. Yes, you can arrange to bring water onto the ship if you have a kid that needs it to mix formula. Or you can also fill up some water bottles at the buffet and bring it back to the cabin. Instead, it’s easier just to order some bottled water for your room. Carnival has it for about $4 for a 12-pack and it keeps you from having to lug on heavy water bottles when you board the ship. Have a one-year-old going on his first cruise? Don’t try to do a week-long trip. The younger your kid, the better it is to do shorter cruises. Not only is this ideal so that Mom and Dad don’t have to be stuck in a tiny cabin with a young child for hours on end, but if your kid were to get sick, it’s a lot nicer knowing it’s only a few days until you are back home instead of it being a week or more until you are home again. Kids love to swim, and there is only so much space in the cabin to hang wet clothes. Instead, bring a few magnetic hooks with you. You can stick these hooks on the metal ceiling, and use them to hang up wet swimsuits. There is also a retractable drying line that runs across the shower, but we find it usually gets in the way to hang clothes here. Every person should expect a clean cabin when taking a cruise, but just like any hotel, there are still spots that don’t get much cleaning attention. Behind and under beds, and tucked away corners may still be dirty. Expect your toddler to find these spots when they are crawling around the room. It’s a bit gross, but it’s a fact of life. 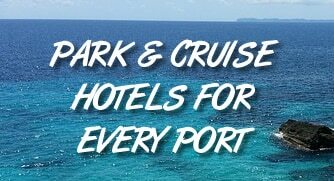 If you are cruising with kids, then you’ll want to stay in the more touristy spots near the ship and popular attractions. As a rule of thumb, the more off-the-path your destination is, the less likely it is to cater to families. So, for instance, it’s less likely to have changing tables or places for kids to run around. Stick with the more touristy spots and you’ll likely have all the comforts you would expect of back home. Most people know that during muster you are assigned a spot to meet in case of emergency. But what if you and your kid are separated when a call to muster takes place? Don’t worry, but understand what will happen. Children are given a wristband with their assigned muster station. If you are not with your child (for instance, you dropped them at the kid’s area), then the staff will ensure that kids are escorted to the correct muster area. One of the worst things about cruise cabins is the lack of outlets. And when you have all sorts of things to plug in for your toddler, including sound machines and nightlights, the lack of outlet space is frustrating. No worry, just pack a cheap outlet adapter. They can be found for about $5 and plug in to give you multiple outlets where there was only one. Seasickness isn’t a huge deal on a cruise, but it does happen. If you’re traveling with your little one on a ship for the first time, then you should be prepared for the possibility. Be sure to pack some seasickness remedies and don’t hesitate to use them if your kid complains of feeling queasy. When you cruise with a child — especially a baby or a toddler — it can feel like anything but a vacation. Kids are a lot of work, and you deserve to take some time to yourself. Don’t feel guilty about dropping the kids off and enjoying some pool time or the casino or dinner, or the evening show with your spouse. Remember, it’s your vacation too. If your kids are old enough to go out on their own around the ship, then be sure that they know the cabin number and how to navigate to the room. This way there’s little chance of them getting lost on the ship. As well, should they need to go back to the room for something (or just to hang out) they can do so without having to get you first. Every year there are stories of people falling overboard due to climbing on the ship’s railing and losing their balance. NEVER let your kids climb on the railing and make it clear right from the start how dangerous it is to even think about sitting on the rail. It’s literally a matter of life and death in some cases. Want to really make your child’s cruise special? Try packing a couple of new toys with you to surprise your kid in the middle of the trip. We’ve found that this is a great way to keep smaller kids entertained if they get bored while at sea and can’t run around like they would at home. Think of it as a cheap insurance policy to keep them entertained and happy. For more on cruising with babies and toddlers, read our complete guide here. Have more tips on cruising with your baby, toddler, or child? Let us know in the comments below. One of the most helpful packing lists I’ve read! Thank you!